Onstage Magazine is adding a new feature called Blue Notes so that we may help keep this important part of our musical heritage alive and thriving. Hector Montes is going to discuss blues artists of the past, as well as inform us about what is going on with today’s performing and recording blues artists. Blue Notes will also feature links to some of his favorite blues music videos, which will complement the articles. I once interviewed jazz great Wynton Marsalis for public radio and asked him how he would define jazz. His initial answer was one word–“Blues.” If I asked this same question of rock, country or other musicians in the United States about their own music, many might very well give the same answer. The first video featured is Muddy Waters with his song “The Blues Had A Baby and They Named It’ Rock & Roll.” The recorded version of this song may be found on the Muddy Waters album Hard Again on Chess Records. Produced by the late blues/rock guitar legend Johnny Winter in 1977, this track illustrates the point about the importance of blues as the foundation of rock. Muddy Waters took blues to another level with his electric guitar (eventually a Telecaster after Fender began producing them), and a band that featured Little Walter, whose harmonica playing is legendary. Hard Again was a return to his original Chicago sound and earned Waters a Grammy in the process. Of course, the Chicago-style sound of Muddy Waters is but one type of this music that has been so influential upon American culture. The instrumentation of blues bands like that of Muddy Waters–two guitars, bass, drums, and piano became the standard for rock bands such as the Rolling Stones, sometimes augmented by blues harp played by Mick Jagger or the late Brian Jones. Join us as we examine all types of country, urban, classic, rock, and modern blues music. Some of these songs became rock classics that you might not have realized were originally recorded by blues artists. We hope you enjoy Blue Notes by Hector here at OnStage Magazine. 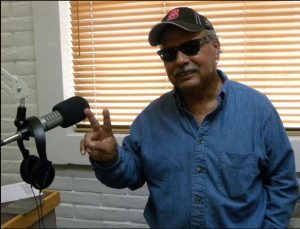 Editor’s note: Hector Montes is the OSM Blue Notes Contributor. He is a longtime educator and public relations professional whose experience includes talk and music radio broadcasting, and video/music production. Montes holds a master’s degree in Social Science Education from Stanford University.